Microsoft Translator has never been my go-to application when it comes to machine translation. I always felt that Google Translator did a better job in turning foreign text into something that resembled something that I could understand. Google Translate is far from perfect, however, and DeepL replaced it for the languages that it supports when it was introduced. Microsoft released a Microsoft Translator update yesterday that improves overall quality by up to 11% for Chinese and German translations from and to English according to the company. Based on human evaluations using industry standard test sets, we are seeing up to 11% improvement in overall quality. The next-generation Neural Machine Translation technology of Microsoft Translator promises better translations. The changes are available on all platforms including on Bing Translate, the Translator application, and the Translator API. Microsoft developed a research system that, the company says, managed to achieve "human parity translation on a commonly used set of news stories"; this new system, which uses next generation neural net architectures and dual learning, has been introduced with the update to the translation API. Microsoft promises to roll out the improvements to additional languages, without mentioning any, in early 2019. While I cannot judge if the quality of Chinese to English or English to Chinese translations have improved, I decided to try and see how well Bing Translator would translate English to German. I copied some sample texts, from this blog and from Wikipedia, to determine how good it is and how it fares against when compared to Google Translate and DeepL translations. My impression based on this very unscientific approach is that Microsoft managed to move very close to Google Translator in regards to translation quality. DeepL still seems to have an edge when it comes to translations as it produced better results. 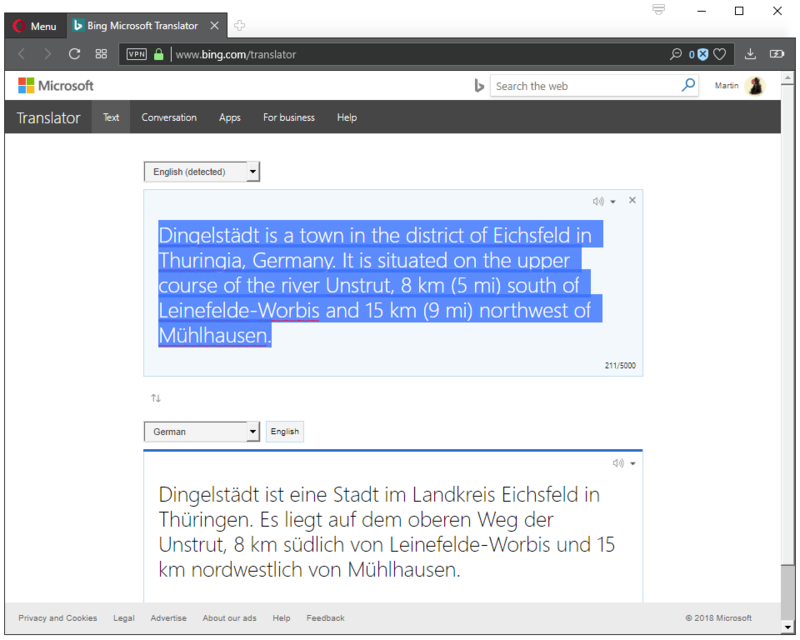 All machine translation samples were understandable on the other hand and it is possible that Microsoft's or Google's translation service may have the edge sometimes. I will stick with DeepL for now provided that I need to translate one of the supported languages. My main gripe with DeepL is that it supports only a few languages (seven in total). Now You: Which translation service do you prefer, and why? How do they even quantify “translation quality”? It seems that they hired some humans for that. I don’t know how these tests looked like, could just be “is the translation of the original text on the left or right better?” questions. But hiring humans is also far from perfect. There are plenty of people these days who act as if they know it all, but they make tons of grammatical or spelling mistakes. Even people who are supposed to be “professional”. I’m using ImTranslator pop up bubble for my translations. It does a reasonable job. Microsoft has focused itself in far too many directions. They are like a one man baseball team trying to cover all of the bases. As a result, they are often “dropping the ball”. They do nothing as well as other more focused providers do. Their main claim to fame, Windows, is in very serious trouble. This is hurting the computer industry. If this keeps up, manufacturers will have no choice but to start providing systems with another operating system. And I am sure everyone can guess what that might be. If Microsoft’s incompetence results in manufacturers to providing easy options aside from Windows, I think that counts as helping the computer industry, not hurting it. Unfortunately, manufacturers have contracts with MS to put Windows OS on their systems. I don’t use Microsoft’s translation services because I don’t use any of that company’s services. I call upon ‘DeepL Translator’ for languages supported by this on-line tool, unfortunately in its free version there is not available api and the translation reuest cannot be handled via a url and therefor a bookmarklet won’t make it. The translations are far better than those of Google which I nevertheless use for other languages which is seldom. Careful with DeepL. I use it a lot. Sometimes it makes serious errors that “Google translate” doesn’t do. I agree that usually the translations made with DeepL are of better quality. But don’t use it, if you can’t check on the result.